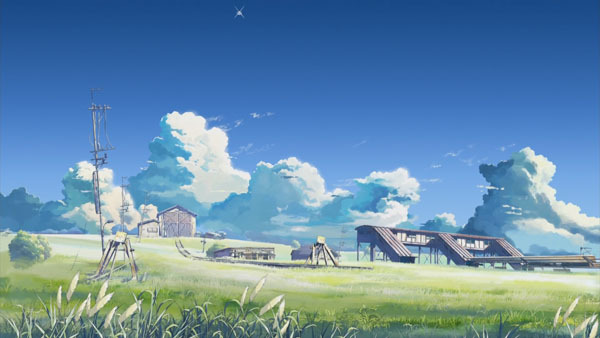 Makoto Shinkai draws clouds well. Really well. I thought it would be fitting for the first post of this blog to deal with its namesake, Kumo no Mukou, Yakusoku no Basho (Beyond the Clouds, the Promised Place or, according to ADV, the film’s subtitle The Place Promised in Our Early Days). Makoto Shinkai’s second major film, Beyond the Clouds is sandwiched between Voices of a Distant Star and 5 Centimeters per Second. Like Voices of a Distant Star before it, Beyond the Clouds tells of an emotional bond overcoming physical limitations to draw people closer.